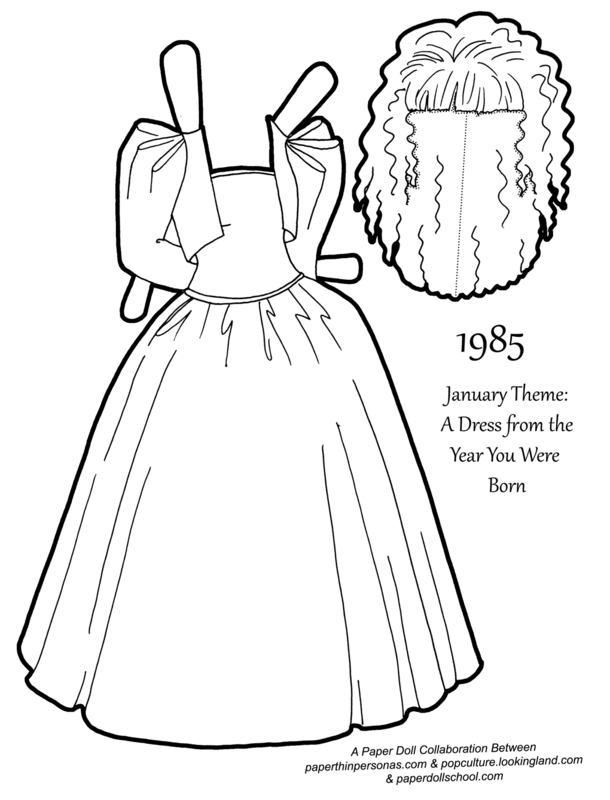 The first theme for our collaborative project was a dress from the year we were each born. So, for me that meant drawing something from 1985. So, I went loooking for clothing from 1885 and came cross this Barbie dresses from Oscar De La Renta. I love Oscar De La Renta’s designs and I had no idea he’d done a series of Barbie clothing. Inspired, I combined this dress and this dress. You can see more of his Barbie designs here and here. My mother was pretty anti-Barbie when I was a kid. She felt that it wasn’t a healthy body type for girls to aspire too, so she mostly bought me Ginny dolls. I did have a few Barbies, of course, but they weren’t my favorites. Anyway, I’m sure Julie and Boots are posting great outfits over on Popculture & Paper Dolls and Paper Doll School, so go check those out to flash out your Collaborative Paper Doll Project wardrobe. Meanwhile, you can donate to support the blog on Patreon or follow the blog on facebook. Yes, there is now a facebook page for the blog. Very nice! Love the glam dress. I loved Barbies and although I never had the Oscar De La Renta gowns, I very clearly remember seeing the image at the Fashion Follower link. And the hair is super 80s. It’s great! man, i remember those de la renta dolls. was never a Barbie person myself either. Love This! I think I remember prom dresses like this. I had Tammy dolls with homemade clothes instead of Barbies when I was a kid, but I think it was as much a money thing as a style thing.